Dr Ron Paul: Swine Flu Just An Attempt For Government To Scare The People! Congressman Ron Paul says that the people responsible for the economic crisis should not be hailed as saviors and given more power to fix the problem that they created, but arrested and criminally prosecuted. 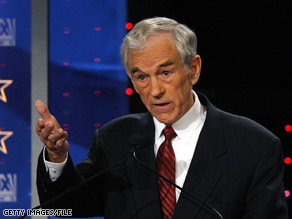 Ron Paul’s opening statement at the House Financial Services Committee was broadcast live to an audience of millions. CAMBRIDGE, Mass. (CNN) – Former presidential candidate Ron Paul criticized President Obama’s economic recovery proposal, but said Saturday that blame for the financial crisis is deep-seated and includes Republicans who failed to hold the line on spending during the Bush administration. He also offered a harsh critique of the three Republican senators who have said they will vote for the economic recovery proposal. A vote is scheduled for early next week. Paul, a Republican congressman from Texas who unsuccessfully sought the GOP nomination for president, said that while some people call Obama’s plan to jumpstart the economy a “stimulus package” he thinks it is a “pure spending package,”in a new video message posted on YouTube. On MSNBC’s Morning Joe, Ron Paul answers questions about fixing the economy. The pundits ganged up on Paul best they could and he not only kept swinging, but injected a healthy dose of common sense into the ongoing debate over the bad economy. There were five Democratic candidates, back-to-back on the same stage at CNN's epic youth-centered town hall in New Hampshire, and all five candidates had to answer the same question: What do you think of Elizabeth's Warren policies? The Iowa Legislature's longest-serving Republican announced Tuesday that because of President Donald Trump, he will be joining the Democratic Party, calling Trump "a poor example for the nation and particularly for our children."